I used Gesha Panama for the base bean. Gesha is an old Ethiopian variety, grown in the highlands of Chiriqui province in Panama. My recommendation is to find a nice lightly roasted bean with good providence and flavour. You want a lighter roast or all you will taste in the final product is burnt coffee and none of the delicate aromatics. 800ml vodka at 40% or 92% Rectified Spirit diluted to 40% with distilled water (you can buy Polish Rectified Spirit for liqueur making at decent bottle shops). 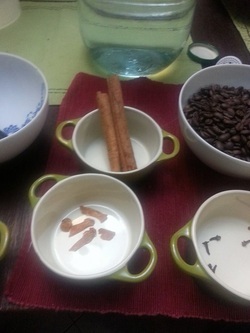 ​200g coffee beans, Gesha Panama or other similar light roast. Whole beans! 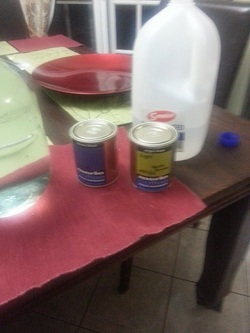 Add all ingredients together in a wide mouthed jar. Leave somewhere warm to macerate for a month. 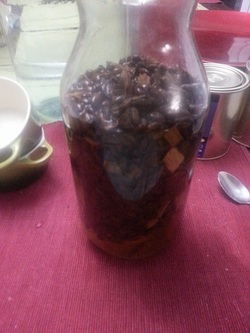 Strain the spiced spirit through a sieve into a jug . Place the sugar and water in a large saucepan over high heat. Stir to dissolve the sugar. Bring to the boil. Add the strained vodka and stir to combine. Remove from the heat. Pour the liqueur into clean bottles. Polish rectified spirit watered down to 40% with distilled water. 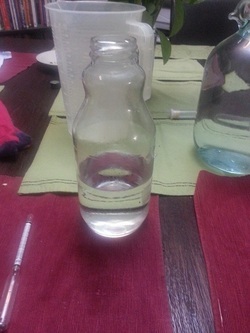 In wide mouthed, sealable jar waiting for other ingredients. 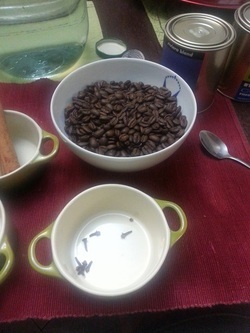 Coffee beans and cloves measured out and waiting. Cassia Sticks, Mace Blades measured out and waiting. 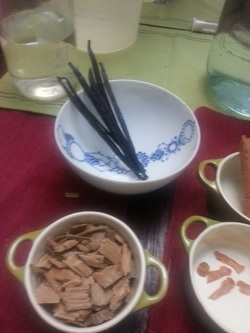 Vanilla Beans, Oak Chips, and Mace Blades measured out and waiting. All ingredients mixed together, and macerating for the next month.